It rained two days in a row, which is merriment (especially for my daughter), because it doesn't rain much here. And when it storms, this is the spot, because one can listen to the rain patter on the wood ceiling and look outdoors at the same time. My mother knitted this blanket years ago, and several shams are handmade by someone local. As you can see, this spot gets used often as you can see by the wrinkles by us and our toy poodle. I've been occupied: painting a painting, painting a piece of furniture, looking at photos from our summer, and also, imagining what to prepare for Vanessa's Fanciful Twist's Witches Tea Party using whatsis around the home. And though the weather is still warm, we cooked a pot of pumpkin soup. Outdoors, my husband and I have sowed our winter kitchen garden, so maybe photos soon. I wish it would rain for 2 days here - I would accomplish so much. What I am up to is sewing - a drop cloth bag for a friend, pillows from IKEA tea towels and a few Christmas items. Oh Su I love your daybed. I have the same one but it is out in the garden. I can't wait to be able to bring it back in the house so that I can cover it with blankets and pillows like you have done with yours. We had two days of rain too which is like a gift since we are in a drought. It used to rain a lot in Autumn, Winter and Spring here in Northern California. But for the past three years it has not. And it is strange not to have rain. I planted my Winter garden too. The snow peas have taken off but my lettuce is not doing too well. I may have to re-plant romaine. We still have peppers and herbs from the Summer garden and our lemons are turning yellow. What an artfully wrinkled daybed! Perfect for a rainy day. No winter garden here and we just finished bringing all the houseplants back inside and have been covering the herbs up for 3 nights, just letting all the big ferns everywhere fend for themselves, having learned my lesson years ago about trying to overwinter them and their shedding messes. Your day bed looks so seducing! 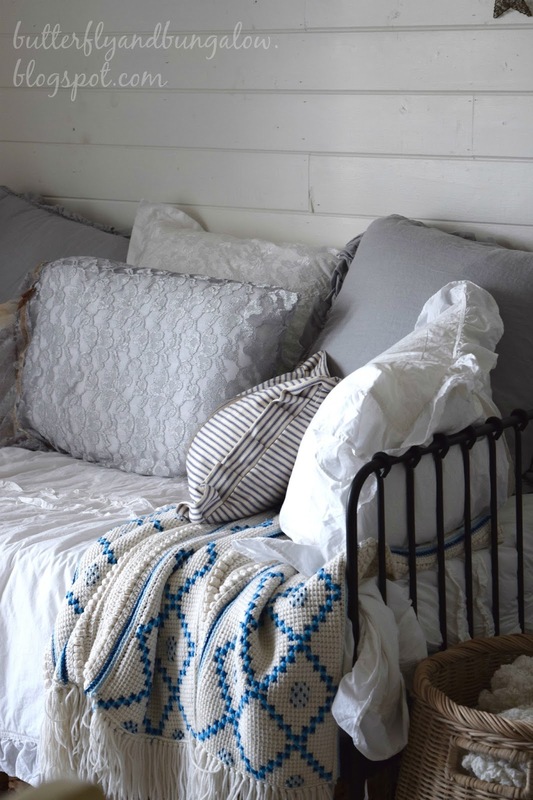 The blanket and ruffled pillows give it that special, ethereal feel. 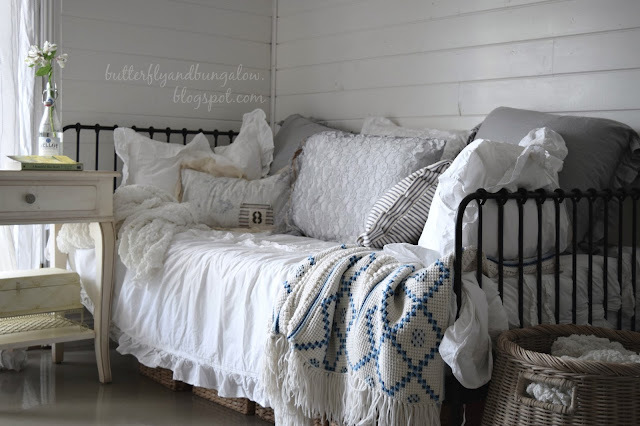 love love love - so pretty and cozy. I want to hang out there! Love your sleeping porch Su. I bet it is awesome to curl up there when there is a storm and listen to nature at it's best. Have a great rest of the week. That is such an amazing place to dream ~ love the mix of pillows on the bed. I am working on gathering ideas for Christmas. Crafting a little tree and new decorations for it. Have a lovely one, Su. Su oh how I adore your sleeping porch and the daybed all adorned with pretty softness. I can see how perfect that spot would be to idle the hours always and enjoy the rain. Me too painting - great minds think alike! I'm faux painting a laundry folding table and making it wonderland like. Plus I am painting a canvas too. 15x15 a thick gallery wrapped one. Both will be revealed on a future post of the laundry room. I always love a visit to your amazing bungalow that oozes creative genius and fun. Hi Su, Love your sleeping porch. Such a cozy spot to spend time. I love it when it rains and being in my studio. I am currently working on holiday and more for my etsy shop. This is the busy season. Enjoy the day and thanks for sharing and always inspiring. What a lovely post. Your porch is very cozy. I love that you are painting. I am painting too but it is the walls and trim of the garage, taking advantage of our Indian summer. It certainly looks like a comforting, cozy spot! A great place to read a book and listen to the music of rain pattering. Such a cozy spot to sit and listen to the rain. I've been working on some Halloween cards for the kids. Su, I just love this space in your house....it is so beautiful and seems the perfect spot for relaxing and enjoying the rain or the sunshine! Hugs! This is a charming corner. I love this daybed. I'll be at The Witches Tea party this year too. I love going to Vanessa's parties! Thanks for stopping by. Love your spot there. Sounds like you are a busy lady. What have I been up to - well I sorted out my fabric and have hand quilted three baby quilts and a front door hanging Christmas banner. I have also been cleaning out cubbards, throwing junk away. I sure wish we would get 2 days of rain. We only got enough to just wet the ground, Not even enough to measure.. I love the photos today. We are busy putting our gardens to bed for winter. :-) I still have four to go. We are still having lovely days here in Wisconsin. 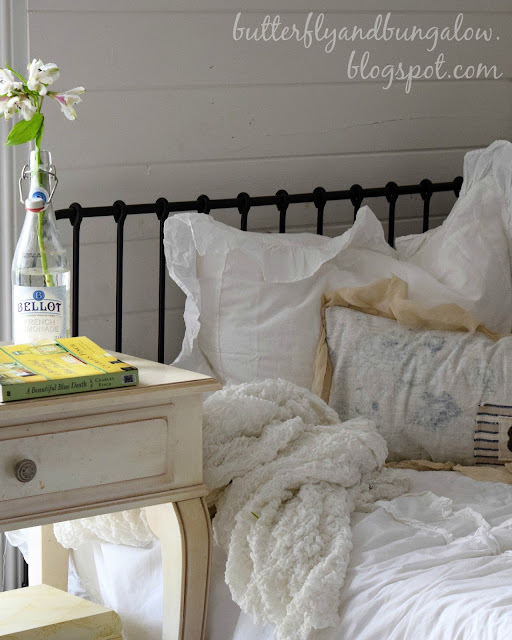 Su, I love your iron bed nested in The corner, it looks like a cozy place to snuggle up and take a break from all the business and just read a book or relax in the beauty you have created. Love all your photos, you have a space to love. Such a pretty bed! It hasn't rained here since May. I'd love to listen to it for a little while. I can picture you and your daughter reading a good book, listening to the patter of the rain and every now and then looking at the drops dripping on the window. I can see why your daughter loves that spot. I'm wanting to crawl through the screen and curl right up. I'm working on a party for part of Vanessa's tea party hop. Can't wait to see what you do. I would be so happy curling up there with a good book! Oh my, that spot is so lovely! 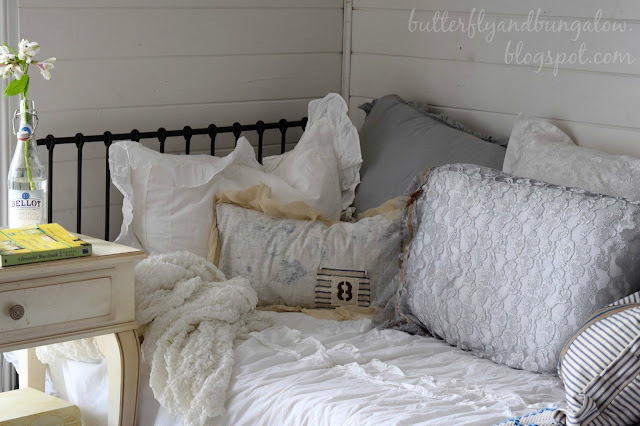 If I had that comfy beautiful daybed I'd never want to leave it. I need to make sure to check out Vanessa's Witches tea party hop and see what everyone does! Some day I'd like to take part but right now I'm just busy trying to get a few paintings done. It does sound like great fun though! I so envy your sleeping porch...I've wanted one most of my life. I join Vanessa's summer party...is she having another? I'll ck it out. What a cosy, lovely nook. A perfect place to spend a rainy afternoon, with a good book and a cup of tea. It has been a rainy day here, and I've hardly moved from my perch on the love seat by the bay window. Reading a good book, glancing out to see the grey skies and gentle rain. It's been a perfect day! Su, I can just see myself sinking into the coziness of your gorgeous daybed. I love listening to rain on the roof and this looks like the perfect spot to do so. Thank you for sharing . What a cozy spot for daydreaming or reading on a rainy day!